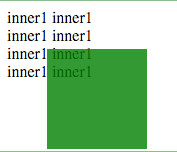 CSS (CSS3) property can be used to set the opacity level of an element. It can have a value from 0.0 to 1.0 (default is 1.0). It works in mostly all browsers. Here is an example screenshot of rendered outcome using opacity.